Humaira Abid / Iole Alessandrini / Juventino Aranda / Hami Bahadori / Jana Brevick / Zachary Burns / Romson Bustillo / Blake Chamberlain / Michelle de la Vega / Ryan Feddersen / Dakota Gearhart / Leah Gerrard / Ari Glass / Lori Goldston / Dayna Hanson / Vic Haven / Gary Hill / Andrew Hoeppner / Jessica Hoffman / Jan Hopkins / Jenny Hyde / Mari Ichimasu / Todd Jannausch / Britta Johnson / Christopher Paul Jordan / Lisa Kinoshita / Robert Lashley / Cheryll Leo-Gwin / Stacey Levine / Holly Ballard Martz / Cathy McClure / Fiona McGuigan / Marilyn Montufar / Tyna Ontko / Clyde Petersen / Kristen Ramirez / George Rodriguez / Paul Rucker / Austin Stiegemeier / Anca Szilagyi / Barbara Earl Thomas / Elissa Washuta / Ellen Ziegler / More TBA! Prior to the party on the 22nd, you can drop in during Capitol Hill Art Walk on October 13, 5-8 pm. Hope to see you on the 13th or 22nd! A fantastic cat is one of Cauliflower’s neighbors: “Lion” by George Rodriguez. Examining the final product with Brian McGuigan, Artist Trust’s Program Director. So I’ve got this reading in a month, and I’ve been thinking a lot about sound and how important reading aloud is for writing. Even without having a performance to prepare for, I like to read drafts aloud to see where they’re working or not. The story I’ll be reading this August 1, “More Like Home Than Home,” uses a lot of footnotes, which is a special listening challenge, so I’ve enlisted my friend Kristen Young to perform the story with me as the voice of the footnotes. I’m really excited to be working on this with her. I’ve also been playing with SoundCloud and hope to record a story or novel chapter soon (and I posted a recording from my last Castalia reading for now). In the meantime, here’s a fabulous article on writing and sound from Constance Hale. 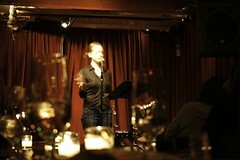 Photo from my reading at the Cornelia Street Cafe, courtesy of Max Tzinman. Well, it was my birthday today, and the weather was just as I like it: snow on the ground, spring in the air. Too bad I’ve got the last bits of bronchitis rattling around in me. Ah well. Sunday night I read “A Meal” and “Lemon Tree Palace” at the Cornelia Street Cafe. As we were competing with Oscar night, and as one of the other readers was home with the plague, it was an intimate gathering, and very pleasant too. Chris Brandt read a series of poems on Thomas Jefferson, and another on Odysseus, and all were excellent. “Stars bouncing on waves” was a phrase from one of the latter that stayed with me. After the reading, a few of us ate at the restaurant upstairs (delicious) and watched the snow come down on pretty Cornelia Street. A delightful night, with the only disconcerting bits in the fiction performed.